Home Blogs Snap Shots How did we end up with 35 mm? How did we end up with 35 mm? Even though few people still use film, the most common denominator has been 35 mm, and despite the fact that the world has gone digital, the reference is still to use 35 mm as the yardstick. The focal length of your digital camera lens may be expressed as being “equivalent to 35 mm” for example. With many film stock sizes previously available, (35 mm, 120, 5×4 and 10×8) it may come as a surprise that still photographers were not the first to use 35 mm. The answer to why the 35 mm size became the most favored lies in two areas. The first was the availability of film. Did you know that the first people to use the 35 mm film with perforated edges were not still photographers, but were the original movie makers? In the late 1890’s this film was introduced to be used in the burgeoning movie market – so there was good availability of film stock of this format and that was 120 years ago. In fact, 35mm film is even now the basic film format most commonly used for motion pictures, and remains relatively unchanged since its introduction in 1889 by Thomas Edison. The origin for the 35 mm size was simply taking the Eastman Kodak 70 mm roll film for photography, being cut in two. William Kennedy Laurie Dickson, working for Edison, then cut four round perforations per frame along both edges. This format was initially called ‘Edison’ size. The flattened perforations were introduced by Bell & Howell around 1900, which remain to this day for camera original film. Kodak-Standard perforations were introduced some ten years later for projection use. However, the first still cameras to utilize this film did not come out till 1913 and there were quite a few brands on offer between 1913 and 1924, but none really ‘caught on’. The milestone in photographic history was the 35 mm camera produced by the German Leica company that came out in 1925. This had actually been based on a 1913 design when the prototype was built by Oskar Barnack. Leica refined this and produced an immediate winner with the following specifications – a focal plane shutter with speeds from 1/25th to 1/500th of a second along with a ‘fast’ f 3.5 lens. The small size, precision and build quality of these cameras made them instantly popular, and began the reputation for highest quality that Leica still enjoys today. In 1930, Leica improved on the original and coupled rangefinders, even faster shutter speeds and interchangeable lenses came on the scene. The next company to join this new breed of cameras was Zeiss Ikon who produced the Contax in 1932, which by 1934 had a coupled rangefinder, a separate optical viewfinder and a range of slow shutter speeds as well. In the earliest days, the photographer had to wind 35mm film into reusable cartridges himself, and cut the film leader. In 1934, Kodak introduced the 135 single use cartridge as we know it today. 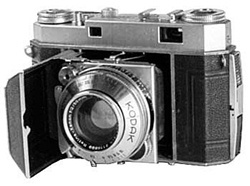 It was the invention of Nagel Camerawerk in Stuttgart, and Kodak was so interested in this invention that it bought the entire company, and marketed the Nagel camera as the Kodak Retina. Board room take-overs were just as frequent then, as they are today. The next major step was the introduction in 1942 of the Kodacolor process to produce color prints and the future of 35 mm photography was sealed. After this, when the Japanese avalanche started, the end result was almost a 35 mm film camera in every home in the western world. That avalanche only slowed when the digital technology became cheap enough (and good enough) to take over the camera market. However, we should not forget Oskar Barnack and the early movie makers! Previous articleRemembering how to spell Alzheimer’s Disease!